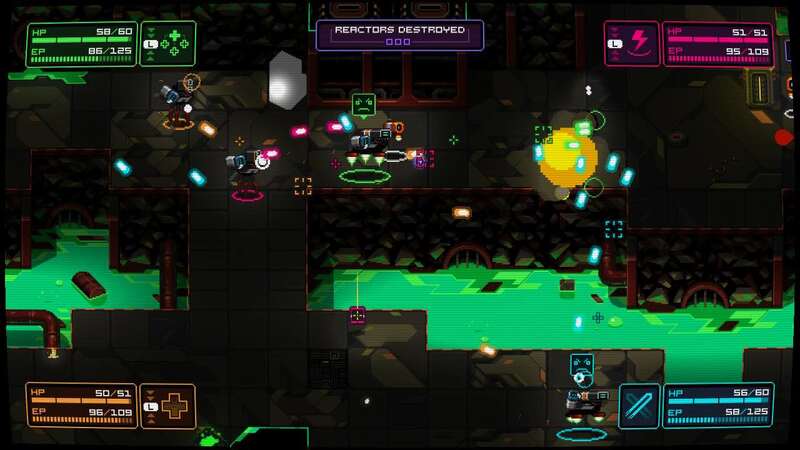 NeuroVoider is the latest rogue-like, twin-stick arcade shooter to grace the indie market on the Nintendo Switch. Developed by Flying Oak Games and published by Plug In Digital this little title mixes the above genres with RPG elements, setting aim to become your next action-packed addiction. You are nothing more than a pink fleshy brain, hell bent on taking out the evil robots that stand in your way. You do this by beating them at their own game, by jumping into your own highly customisable robot and blasting them all to oblivion like Johnny-5 going postal. After a brief tutorial, you have a choice of three class types to choose from: Dash, Rampage and Fortress. The Dash class has a light and nimble play style that is more focused on melee and evasion. The Rampage class works as the medium all-rounder, and the Heavy class is the Zangief of the bunch that, by default, equips you with a shield to compensate your slower mobility. Regardless of class, each robot’s offensive and defensive options eat up your rechargeable EP meter, pressuring you to keep a close eye on how you balance your resources in battle. Empty your EP bar and you will burn out for a short while, leaving you completely vulnerable and on the retreat. You also acquire a unique perk before you set off on a run through. These can seem overwhelming at first, as there are 27 different types to choose from. There’s a big chance that you will probably lean towards the health perk until you’re more experienced, as death is not only permanent, but any loot and upgrades you discover are completely wiped clean – leaving you back to square one on your next conquest. Although nothing at all carries over, you are left with a learning experience as you start to hone into your preferred combination of weapon types and approach, thus creating your own balance as you fully customise your robot in between levels. Your customisation options are dependant on what you have looted within a level that will give you perks on different parts of your body. This includes new weapons to let loose with which you can quickly test before equipping them. You tend to acquire more parts for the other types of classes within loot that you find that can give you a persuasive incentive to convert over and try out. You can also scrap other class customisations for currency, as well as any weaker parts you may have obtained quite easily. Your currency can then be used to strengthen the class that you may stubbornly prefer, or roll the dice to randomly issue new and sometimes rarer gear that can provide you with that edge in battle. At first, modifying and preparing your machine between levels can feel like it breaks the momentum of its fast-paced gameplay. 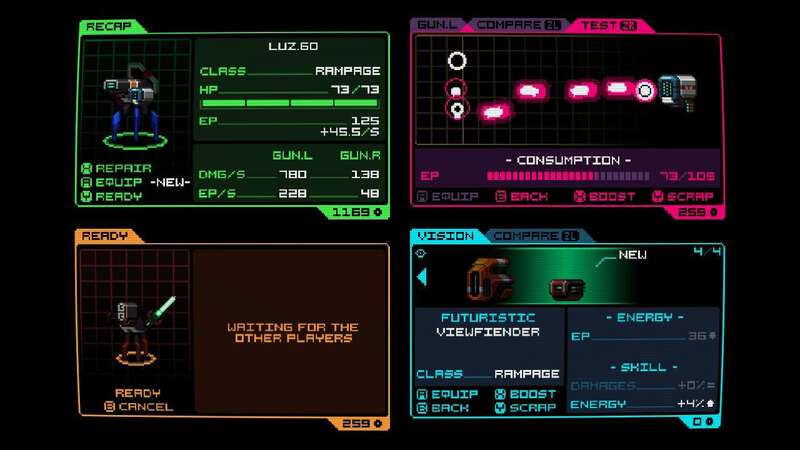 This soon changes though as you start to find your feet on how to manage your stats efficiently, actually turning this part of the game into one of the more addictive elements that NeuroVoider has to offer. Your overall main objective is to destroy a set amount of control units before you can decide to warp back out of the area. Some may frown on the lack of variable objectives but I saw it more as a level would end in a similar fashion to Mario jumping on a flagpole. Although it would have been nice to have different goals to fulfil, it doesn’t really take anything away from the overall experience. The world structure consists of 16 levels with four bosses evenly splitting the numbers. You have a choice of three randomly generated landscapes to choose from for each level that gives you a heads up on the size of the map, a number of elite enemies that are on them and loot potential. This further merges into your strategic approach to delve even deeper in NeuroVoider. There are also special stages that can pop up if you choose to pursue them giving you a much higher loot count. This doesn’t go without risk, however, as an overwhelming number of enemies will swarm you like the zombies from World War Z if you’re not vigilant enough. The environments themselves have various visual themes to them that fit nicely with the 16-bit visual look that it is going for. There are a few discrepancies in regards to visual depth as it can sometimes be quite difficult to separate what you can and can’t navigate across, which can leave you trapped and open for attack. This can also be an issue when it comes to taking cover as you take a shot in the cake hole because you can’t tell if the object is actually tall enough to hide behind. The controls are clean and responsive, gradually improving as you upgrade your bot. You can also blast away with three other mates locally which makes way for some great chaotic multiplayer fun. The Nintendo Switch version also has a split Joy-Con option so you can still battle along with a wingman. Because the Joy-Con has only one analogue stick, the game tries to compensate this by giving you an auto-aim. Whilst this is still a fun experience, you do feel as though your missing an arm and if anything, feels like your slightly cheating. Its inclusion is still very welcome though, and a very convenient feature to have. Unfortunately, online multiplayer is absent which is an absolute pity as I could see myself with a few mates tearing it up across the net. NeuroVoider‘s overall look is decent, with smooth frame rates and crisp retro aesthetics on both in TV Mode and Handheld Mode. The many obtainable parts of your robot all visually complement each other with their basic but fluid animations. The music by Dan Terminus really does stand out and fits perfectly with it’s 80s style electro synth beat, giving you that sci-fi B-movie feel that goes hand-in-hand with its art design. 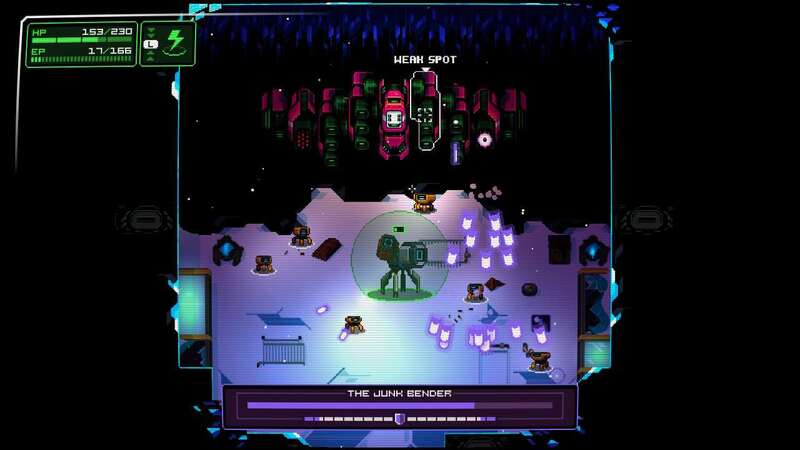 To those well versed in rogue-like games, NeuroVoider may seem a bit run-of-the-mill in terms of bringing anything brand new to the genre. To those that are a little less experienced though – myself included – it is a great introduction to the genre that is very addictive and challenging but never unfair. The easy mode is a great way to sink your teeth in and that alone holds plenty of challenge. It is The Binding Of Issac: Afterbirth+ on a budget if you want to compare value and likeness, but don’t compare them both too much because NeuroVoider definitely does hold its own.